Hello All of my Wonderful Readers! I am back from the dead, no actually just back from my crazy personal life. In my last post, Life…Uh…Finds…a…Way, I mentioned that my boyfriend and I were looking to buy a house. And we did! Also that meant that we had to move and that was very time consuming. And once we were in our new home we spent about 2 months painting and fixing it up. This is why I have not had time for my Sims or this blog. I literally have been to busy with real life! Now I have more time to play and update the blog, I am excited for the return of the Prospero Family and I also have a few new builds I will be sharing with you soon. Thank you everyone for your continued support of this blog and your patience while I was gone! A little sneak peak at our new house with my Simself and my boyfriend. Unfortunately I have just run into a catastrophic failure with my Prospero Family story. None of my screenshot are not saving in my screenshot folder! This means that I cannot continue with the story until I can solve what is going on with my game. According to the internet, it could be that my screenshot folder is full, I’ve tried to move everything to a new folder and clean it out. Or the save data is corrupted and I would have to start a new save. I tried to fix it a little today before I had to go to work, but I wasn’t successful and I do not know what I will decide to do if the file is corrupted and I have to start over. I am sorry but there will be no new posts for a few days. Any help or ideas are much appreciated so I can continue with this Family and story! On a happier note, WHO IS EXCITED FOR THE NEW SPA DAY GAME PACK! Tell me about it in the comments. Here is the big surprise I hinted at in my update! I have created a legacy challenge that is predominately designed for builders but I think that anyone will have fun playing it. It also not as restrictive as traditional legacies and allows for many types of game play styles. I will also be doing a Let’s Play video series for this challenge, I will be posting the link soon when the video is finished. Both the cities of Willow Creek and Oasis Springs have suffered from a severe economic downfall and a major increase in violence, pretty much think Gotham City before Batman cleaned it up. Your sim wants to start a legacy but they think that both towns are too dangerous to start and raise 10 generations of a family in. They have heard that Simsvillle is expanding the suburbs around the Willow Creek area into a new city called Newcrest and they are looking for sims to settle this new town! Your sim immediately signs up and since they are actually the first to sign up they are declared the unofficial mayor of Newcrest and it is going to be their responsibility to build the city of Newcrest from the ground up! Since Newcrest is a new world with no development there are no houses or community lots for your sims to enjoy yet, this is going to be one of your founders responsibilities. Also your founder my never return to either Willow Creek or Oasis Springs until their legacy has been completed. However, they may travel to Granite Falls and Magnolia Promenade, but may not live in those areas. It will be your Legacy’s responsibility and gift to the community to build all the neighborhoods and community lots for the future of Newcrest. Each generation will have a specific building goal and cannot build until they have completed their job and aspiration that lays the foundation for their building goals. This challenge follows some of the original Legacy Rules but I have changed and added new ones, so please visit the Challenge Page to read the rules and full descriptions of each generations goals and tasks. Thank you! Perfect Patio Stuff Pack Coming Next Week! Get ready for hot tubs, grills and new furniture and decor to have fun in the sun with! The stuff pack was announced today on TheSims.com blog and will include HOT TUBS! As well as new furniture, including grills and some new summer clothes, including new swimsuits! This pack looks similar to the Outdoor Living Pack from Sims 3, which I loved. EA wanted this hot tub to be the best in the series and wrote this on their blog about its new features. But most exciting is the addition of the all-new hot tub! Up to eight Sims (including children, for the first time in The Sims history!) can be in the hot tub at once. It’s a great place to hang out, and can get even better if your Sims enhance it with the stereo and aromatherapy upgrades. Sure, hanging out in hot water is pretty awesome, but listening to some killer music and enjoying pleasant aromas at the same time? That’s livin’ the life. We wanted to make sure that hot tubs in The Sims 4 were the best in the series, and we think you (and your Sims) are going to love them. The Sims 4 Perfect Patio Stuff has that and much more – and we can’t wait for you to see it for yourself next week! I will end with two more photos, you can check out the new outfits, hair and objects in them. The new world of Newcrest was announced by EA today. This is their answer to the compliants that there isn’t enough space for people’s growing families and neighborhoods. This topic has already sparked heated discussions on The Sims Forum with completely opposite opinions of this world. Tell me what YOU think about Newcrest in the comments! I am very excited for a new world and more space for our sims to grow and live. Since I am primarily a builder, having the extra space it great for me. The world has three neighborhoods with 5 lots per ‘hood, and all of the the lots are empty. Newcrest looks like a suburban area outside of a larger city as you can see in the photo above, the lots are mostly small sizes and according to the article on The Sims blog there is only one large lot measuring 50×40. I am disappointed that there is no 50×50 sized lots, which is my favorite size to build on. But in my opinion the smaller lots sizes fit in with the suburban feel of the neighborhoods. The Sims have released a short announcement video showing the neighborhoods, you can watch it below. Some Forum members have noticed that Newcrest looks very similar to Willow Creek and have complained that the developers did not put any actual work into the creating this world and we, as players, shouldn’t accept free content like this when there are major items still missing from the game, like toddlers for example. I personally don’t mind the missing toddlers but many other players are very affected by them. I miss cars you can actually use and a real beach. But everybody has their own complaints. Here are some of the comments made about the new world announcement. …all the looks like the neighbor hoods we already have got mixed and matched with other neighborhoods. No, it’s not free at all. What did we pay for our game again? That’s right: we payed a lot of money to get a fully fledged out game. Instead we got: maps with a few lots, missing content (they have to add it back now bit by bit because they know they have to do some damage control). If EA took the time to create a decent base game version of the Sims 4, all of these ”FREE” patches would not be needed. And that means that we didn’t have to wait for all of this stuff to come back to the game (for months!). So no, EA is not generous, EA is no charity, EA just knows how they can milk the game at any costs. Giving these ”free” updates will make people willing to pay again, so they make money afterall. It’s not like EA is doing this because they like to ”give stuff” for free, no, it’s because they have to cover up their own fail. I don’t see it as ‘free’ per se, we paid $60-$80 for 50 or less lots in the base game. I would say thanks, it’s about time. Either it’s shameful content ea should be apologizing for or it’s so good that we should be thanking the complainers for getting it for us. Which is it? You can’t have it both ways. I think I’d rather thank ea for it and be happy for those who wanted it. 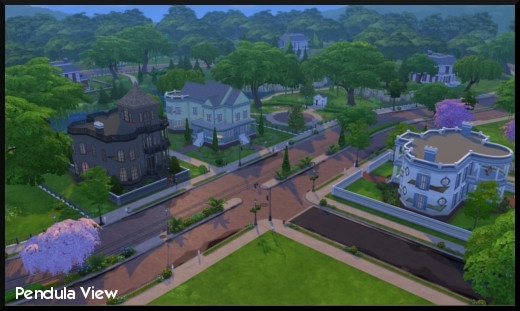 I absolutely agree with Ponderberries about the confusion, on the one hand I am delighted to have a new world with more space to build BUT Newcrest does seem like a rehash of Willow Creek with slightly different background, as other Forum members have pointed out. I see this as the lazy way of giving us Simmers what we have been asking for, I am thankful and very happy that is it free. However if this were paid content I would not buy it, and I own every expansion, game pack and stuff pack for The Sims 4, because it isn’t worth the money. I would love different scenery to look at instead of the same type as Willow Creek and a completely unique feel to the neighborhood instead of a very sterile suburban feel where all the background houses look the same. Where is the beautiful Tudor village scenery from the concept art and pre-release game? There are also community concerns about how the culling cap, which is 180 sims, will be affected by the addition of a new world. Previously the Guru’s have stated that culling is working as it is intended, however Daniel Hiatt (@SimGuruDaniel) tweeted this in response a question about culling, which sort of indicates that perhaps it isn’t working properly. @TheSimScraper @GrimSuruDoi We are working on ways to improve the situation. Overall I am happy and excited that we are getting a new world for FREE! I hope that it has interesting little areas to explore in the different neighborhoods, like the playgrounds or community gardens in worlds we have now. Maybe there will even be a hidden lot, I think that is asking too much of a free world but I would be happy to be wrong. At this point I am thankful that The Sims franchise wants to sees its players satisfied and tries find solutions for the community’s concerns and wants. However, I do wish they had put a little more effort into making Newcrest feel like its own unique world and not just a suburban area of another city. That being said I am a builder and I will release some lots especially designed for Newcrest soon! Tell me what you think of the new wold of Newcrest in the comments!